We’d love your help. Let us know what’s wrong with this preview of The Complete Collected Poems by Maya Angelou. To ask other readers questions about The Complete Collected Poems, please sign up. What I like about poetry is that it is never completely "read". Like the Akshaya Patra ("Inexhaustible Vessel") in the Indian Epic Mahabharata, which keeps on delivering food no matter how many times one approaches it, a poetry book will keep on supplying food for the intellect. In every new reading of a favourite poem, you will find something fresh to appreciate. 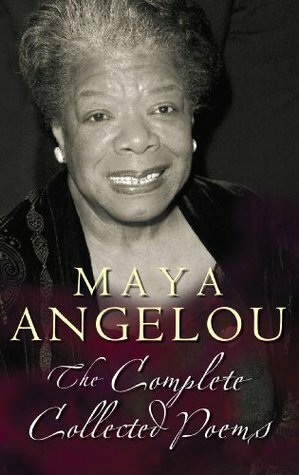 I read this book by Maya Angelou after I finished the first part of her biography, I Know Why the Caged Bird Sings, because I was impr What I like about poetry is that it is never completely "read". Like the Akshaya Patra ("Inexhaustible Vessel") in the Indian Epic Mahabharata, which keeps on delivering food no matter how many times one approaches it, a poetry book will keep on supplying food for the intellect. In every new reading of a favourite poem, you will find something fresh to appreciate. I read this book by Maya Angelou after I finished the first part of her biography, I Know Why the Caged Bird Sings, because I was impressed by her boldness and candour. Maya does not try to gloss over the fact that she's black: she embraces it, along with all the distressing historical baggage that comes with it. This is remembrance with a vengeance. The past, with it tales of violence, rapes, lynchings and mutilations is not forgotten, neither is it used as force of blind hatred and revenge. It is absorbed and sublimated in the psyche. What is celebrated here is the endurance of a race forced to live for untold years without even the basic dignity afforded to any human being - their humanity. deep in their withered flanks. This is the power of silent resistance, of suffering converted to strength. This is what empowered Mahatma Gandhi and Nelson Mandela. And when it's combined with an unapologetic and fiercely sexual femininity, it becomes almost too hot to handle. This phenomenal woman who represents all of Africa also has a bone to pick with her white sister: of traumas passed down through the generations from myth to the present age, which must be exorcised like dust slowly filling ruts on the road of history. Cathedrals, seas of golden hair. Chains, where I was bound. Ultimately, among all the poems contained here, it was old man Willie who really captivated me. I'm the rustle in the autumn leaves. Actual rating, 3.7 stars. I loved most of the poems in this collection but a few of them just didn't click with me probably because I wasn't familiar with the sociocultural contexts within. She came to my college to give a lecture. Unfortunately, as I was the night circulation supervisor in the library, I couldn't go. But - my favorite literature teacher, Helen Cullins Smith (who was the lady responsible for Ms. Angelou's coming) gave her the poem I'd been inspired to write...Helen came into the library the next day and gave me an announcement that Maya had signed...it said "Wanda Lea — Write On!" I'm still reading her works. A beautiful collection of poems by the wonderful and amazing poet, the late Maya Angelou. There is really nothing else that needs said. I hold Maya Angelou as an icon in my mind, a source of wisdom and grace. This collection also reminds me that she was a brilliantly passionate, even angry, black woman. I was sometimes uncomfortable, often moved, driven to read lines two or three times and always, always in awe. That's good poetry. Maya Angelou writes with rhythm, verve, anger, celebration, sexiness. Her poetry is measured, balanced, and rhymed, and it carries the music of her spirit. Whether defiant, empowering, confrontational, sensual, or accepting, each poem is an anthem. Personal favourites include Caged Bird, Preacher Don't Send Me, On Working White Liberals, Still I Rise, and Equality. I love Maya Angelou and was so sad when she past away. I don't read poetry usually but loved Maya Angelou's work and loved hearing her when she recited her work. While reading this I could image Ms. Angelou reciting it in her beautiful deep voice that had so much character to it. A range of subjects from rights of a people a gender to spiritual beliefs. I don't care if this is about mooning over a missing lover or a loss of faith, it's just awful. We all have these moments as poets, but someone should know better than to let her put this in a collection. And it's not the only piece like that. Wow. See what she did there? And you wonder why those fat white Republican men in Congress say she's controversial. slipping in the liquid of its drip. my window and the soup. Since the beginning of the collective conscience of mankind, even before we discovered how to write and read, humans have always expressed feelings in the form of words flowing in rhythm or should I say poetry. Maya Angelou has a sense of sudden sentimental tenderness, her words will make you part of the situation within a second. Her poem doesn't consist of words, it consists of a manipulative stream of soft strokes. This book engulfs a complete collection of her poems and it has been absolutely Since the beginning of the collective conscience of mankind, even before we discovered how to write and read, humans have always expressed feelings in the form of words flowing in rhythm or should I say poetry. Maya Angelou has a sense of sudden sentimental tenderness, her words will make you part of the situation within a second. Her poem doesn't consist of words, it consists of a manipulative stream of soft strokes. This book engulfs a complete collection of her poems and it has been absolutely brilliant. Her poem collection "Just Give Me a Cool Drink of Water 'fore I Diiie" and "Still I Rise" are an elegant piece of art. I feel really sensible after reading her work. I think I am gonna write a blog about it. This book is a collection of poems by Maya Angelou. I am reviewing the poem "Phenomenal Woman". This is a poem that states how phenomenal women are. It describes how powerful women can appear to those around them. We can catch a man's attention by the way we walk into the room or the way we stand. It reminds us that we are phenomenal because we are strong, able to take care of so many other people, take care of our homes, our families yet able to have careers. Women are phenomenal because we can This book is a collection of poems by Maya Angelou. I am reviewing the poem "Phenomenal Woman". This is a poem that states how phenomenal women are. It describes how powerful women can appear to those around them. We can catch a man's attention by the way we walk into the room or the way we stand. It reminds us that we are phenomenal because we are strong, able to take care of so many other people, take care of our homes, our families yet able to have careers. Women are phenomenal because we can do it all and be so much to so many people. It makes me feel empowered and strong! As with all collections, my rating refers to my overall impression, an informal average. In this set of poems, I found several which I loved for the rhythym & rhyme, several others I loved for the content. Others I found stirred up my feelings, which I admire and are powerful but disturbing. Only a few left me uninterested. I would strongly recommend this poetry, especially to women. Angelou has a strong feminist voice as well as a voice for African-Americans. She captures the anger as well a As with all collections, my rating refers to my overall impression, an informal average. In this set of poems, I found several which I loved for the rhythym & rhyme, several others I loved for the content. Others I found stirred up my feelings, which I admire and are powerful but disturbing. Only a few left me uninterested. This is truly a wonderful book that is good for the soul. I had read many of Maya Angelou's books before, so had read many of the poems before. Yet, as I read through them all with this reading -- in less than a day -- I found myself once again inspired, moved, touched, and so much more. I am sure I will return and read this book a few more times. Angelou's poems are like songs that tell passionate, personal stories. She speaks with depth and intimacy. She uses the vernacular of black American heritage to reveal ourselves to us, our humanness, in all its frightening, shameful, mysterious and wonderful aspects. Powerful and involving. The spirit of love that is entrenched in her desire for social change is always a breath of fresh air. A poem by Maya Angelou anytime is a fine good read. Very now and then I like to take a big huge dose of her great work. I don't own many poetry books, but this is one of the few and a rare jewel among them. My favorite poem is I Know Why The Caged Bird Sings, since it's meaning is different for whoever reads it. Some good, some bad. Or maybe it was more a case of some okay, some bloody amazing. I'd recommend reading those from 'And Still I Rise' and go from there. I think the book is much better than what I gave it credit for. However, I had a hard time understanding a lot of the poems and therefore I couldn't like it as much. But the ones I understood were great! Ah, poetry at its finest. Taking my time, letting each poem seep into me, was the perfect way to consume this book. The way Maya Angelou connects... Each poem evoked a strong feeling- empathy, empowerment, anger, excitement. Kind of blew me away. Stunning and hauntingly beautiful collection of poetry. Maya Angelou was truly an amazing woman. I feel that Maya Angelou is the female Langston Hughes--and for a new generation. There's that same rhythm, the same flair, the same knowing. Of course, all poets want to be their own voice, and she really is that. It's just that some of her things have a Hughes quality to them. There are masterful poems throughout the book. A few of my favorites are "Late October" with its gently reflective cast, the impatient "The Telephone," and "He Went Home." There are too many wonderful poems to count. Many I feel that Maya Angelou is the female Langston Hughes--and for a new generation. There's that same rhythm, the same flair, the same knowing. Of course, all poets want to be their own voice, and she really is that. It's just that some of her things have a Hughes quality to them. There are masterful poems throughout the book. A few of my favorites are "Late October" with its gently reflective cast, the impatient "The Telephone," and "He Went Home." There are too many wonderful poems to count. Many of them share a sense of loneliness, of betrayal, of bitterness, but that's not the theme of the whole collection. THIS WAS THE BEST BOOK I HAVE EVER READ!!!! IT IS VERY VERY VERY VERY INSPIRAIONAL! Maya Angelou was an incredible woman to me, one who spoke to truth every time she had the opportunity to meet another human being. My favorite poem in this collection is Phenomenal Woman, but there are poems that would touch anyone. I will be adding this creation to my library in the future in order to continue hearing Miss Angelou's voice in my ear. What a gift she has, and continues to be to this world. Invigorated, reduced to tears, moved...this collection speaks through years, fears, triumphs, atrocities, and dreams. If only I had gained the chance to sit and speak awhile with Maya Angelou.... The Complete Collected Poems, at least, exists, and shares thoughts and experiences bigger than just one soul. Maya Angelou needs no accolades from me. This comprehensive collection showcases her flexible masterful voice, naming anger and humor, both personal and societal. She's raw, intimate, funny, true, and ultimately hopeful. I will be returning to her poems, I'm sure.